Benji is a 6 yr old Long hair Chihuahua/Pekingese male. He weighs about 10 pounds and had just been neutered on Jan. 31st. He has a green tattoo near the incision. 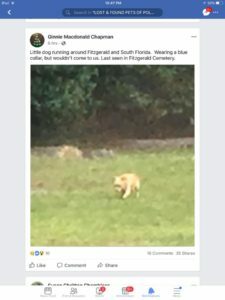 He was last seen in the Lakeland area of S. Florida Ave and Fitzgerald near the cemetery. He has been spotted by several people but is very scared and runs away. If you find him or he is brought to your shelter, please call me at 215-439-8583 or report him to the SPCA of Florida where he was adopted.